AquaTops FORZA 15-25 Power Filter comes equipped with all the necessary filter media to ensure superior filtration: Mechanical, Chemical & Biological. The 15-25 utilizes a filtration chamber system with replaceable filter sponge cartridges enhanced with AquaTops Activated Carbon and Biological Media Trays with maximum surface-area for your beneficial bacteria to colonize and help keep clean water. 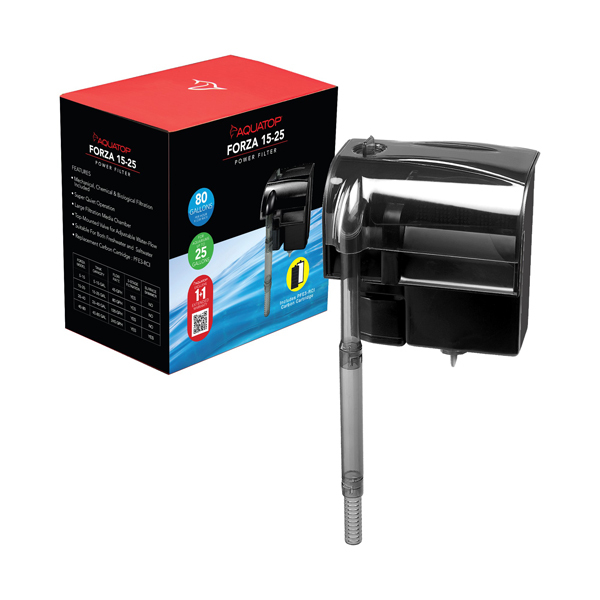 The FORZA 15-25s innovative and flexible design is perfect to help you eradicate and control free-floating debris and harmful waste from the aquarium in both freshwater and saltwater. love the large media space,can add extra media as needed.It's so quiet I can't hear it running,unlike most small filters.The flow control is wonderful for feeding time,less food being wasted.the bio pad is works better than sponges,doesn't grt clogged up or hold oders.